Director Zack Snyder isn’t one to shy away from sharing his progress on whatever DCEU project he is working on, although what he may post on social media may not be as spoilerish as a clip or a very revealing image. But now that principal photography has been completed, the director is in a sharing mood once again. To commemorate the end of production of the upcoming Justice League, Snyder has shared a sizzle reel for your enjoyment. Snyder posted the sizzle reel on his official Twitter account. Some of these shots we’ve seen before in the trailer that was shown at SDCC earlier this year. All the different angles of Bruce Wayne (Ben Affleck) asking if townfolk know about Aquaman’s (Jason Momoa) whereabouts and Aquaman himself getting drenched as tides crash. There’s also more to the stairwell that Batman, Wonder Woman (Gal Gadot), The Flash (Ezra Miller), and Cyborg (Ray Fisher) walk through. Since this is all pre-production work, there are no effects added in, hence why you see Fisher wearing a mo-cap suit. Our heroes also descend in an elevator to some room that we have yet to see. But most importantly, there is still no sight of the Man of Steel (Henry Cavill). If Snyder and Warner Bros. are putting that much effort into concealing him, then Superman’s resurrection better live up to that expectation. 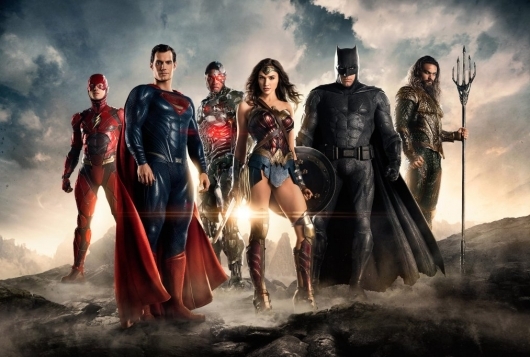 Also starring J.K. Simmons, Willem Dafoe, and more, Justice League opens November 17, 2017.